So here’s this ultra simple and awesome dish: Squash Curry. Simple, hearty and healthy! Living with food allergies does not have to be boring! By the time this posts, I will be in Hawaii on vacation. Thank god for being able to schedule posts as this means I don’t have to take my laptop with me. This will be my first time traveling for more than a couple of days after being diagnosed with all the food issues. Fortunately, we were able to find places to stay with kitchens. So I’ll be cooking in Hawaii and hopefully learning more about its cuisine! I made this with a mix of one squash and one small pumpkin each. For a sweeter version, use just the delicata squash. 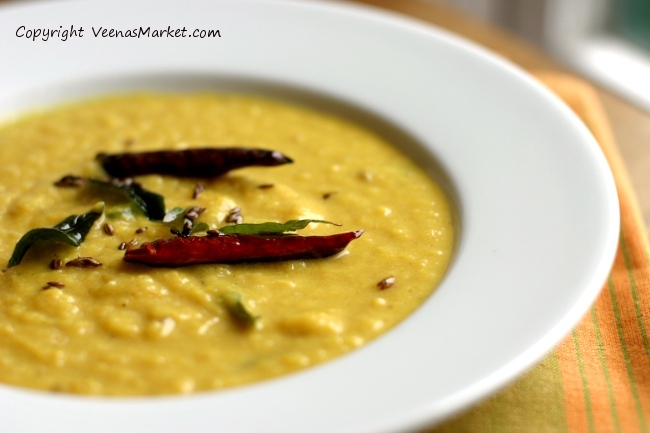 Heat the ghee or oil in a small saucepan. Sizzle the cumin seeds, curry leaves and red chilis. After 10 seconds, add the ginger and green chilis and saute for another 20 seconds. Remove from heat. This is your tadka or spice seasoning. Thin out the puree to your desired consistency and warm up in the microwave. I like the consistency of this curry to be thinner than pumpkin soup but not too runny. Mix in the tadka. Add salt and lime juice to taste. Serve with rice and cucumber. Simple, hearty and healthy! Living with food allergies does not have to be boring! Ah the memories! Pineapple Curry from Udupi. By the time the train pulled into the station in Mangalore, it was past 9 in the evening. I’d already lugged my black suitcase from below the seat in front of me to the carriage door, ready to disembark in seconds. This was my first time traveling alone by train in India. After a 7 hour ride in a full carriage, and some uncomfortable stares from people silently questioning what a decent looking young woman was doing traveling by herself, I was more than ready to get off. But no matter, I was in Mangalore! And I was looking forward to meeting my old neighbors and to a couple of days of world famous Udupi food. If you’ve ever been to a South Indian restaurant outside of India, there’s a 50% chance it is called Udupi after the seaside town that is some forty miles north of Mangalore on the west coast of India. The Tulu community, of this region spread to other parts of India especially around the time of WW1 and WW2 escaping food rations and disease. Wherever they went, the Tulus opened restaurants serving Udupi cuisine. Over time, the restaurants served the most popular dishes like Dosas (crispy lentil and rice crepes), Idlis (steamed rice cakes), and Vadas (savory doughnuts). And so I came to this epicenter of good food with high expectations and lots of childhood memories. My cousin who studied in the area had introduced my brother and I to Udupi fish fry back in 1996 on one of our first trips back to India. So while I could always eat a good dosa or idli, it was this fish fry, red from the spices it’s fried with, that I had a hankering for. Gadbad ice cream, a dessert where layers of various ice cream flavors are alternated with dry fruits, fresh fruits and nuts, is a recent but iconic Mangalore ‘food’. One summer when my cousins and I were kids, we spent our summer vacation in Mangalore while my grandfather recovered from surgery. This was our treat of choice and we indulged regularly! The Gadbad ice cream was the only thing still available everywhere in Mangalore and Udupi. None of those other dishes I’d reminisced about over the years were served anywhere I went. All the restaurants had the same standard menu that was to be found in Udupi restaurants elsewhere in the world. The difference was they also served North Indian and Chinese food. If you’ve had a different experience and know of great restaurants in Udupi, please share in the comments! Who the hell goes to Udupi for Chinese food, I complained bitterly to myself. My only consolation of having traveled far to get to Mangalore was to visit those old neighbors who I hadn’t seen in more than a decade. So, imagine my joy, when, after having returned to Bangalore, I was offered a cooking lesson with a family friend who is from Mangalore! Susheela Aunty, the family friend who gave me the lesson is an expert in making pineapple curry, a very close relative of the mango curry of my youth. It is now my pleasure to share this recipe with you. Cooking this in rainy Seattle brings back not only the memories of my recent trip to India a couple of months ago, but also all those childhood memories that seem tied to food in one way or another. This dish is slightly more complicated than most other recipes that I share on this blog. There are a few more ingredients and cooking steps. But I hope that you will find the time and patience to try this dish. It is truly worth it. Click here for a video version of the pineapple curry recipe. * If using frozen coconut, thaw before using. If using dessicated coconut, rehydrate in warm water for 10 minutes. Roast dry red chilis in 1 tablespoon vegetable oil on medium heat for 3 minutes. 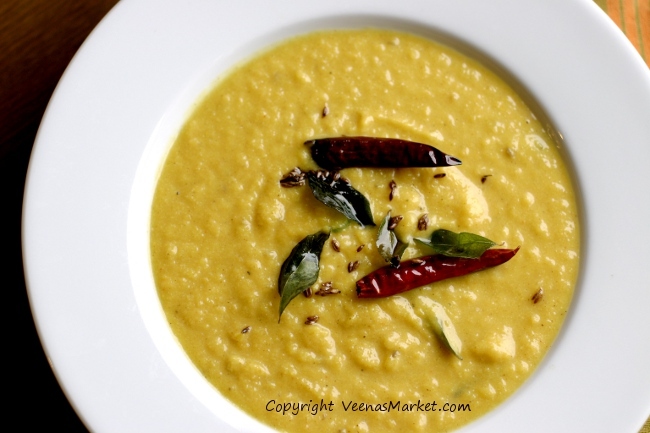 Remove the chilis and in the same pan, saute urud dal, coriander seeds, cumin seeds, fenugreek, curry leaf stems or 2-3 curry leaves, and asafetida for 2-3 minutes on medium heat. Add the grated coconut and roasted chilies. Saute for another 2 minutes on medium heat. Remove and put aside to cool. Heat 1 tablespoon vegetable oil over medium heat in the same pan or another big enough to hold all the pineapple pieces and water When you see oil ripples on the surface, throw in a mustard seed. If it sizzles, the oil is hot enough. Add the black mustard seeds and the curry leaves and fry for 15 seconds. Add and bring to a gentle boil 2 cups of water, jaggery and turmeric. Add the diced pineapple. Bring again to a boil, lower heat and simmer covered for 20 minutes till the pineapple can be easily pinched. 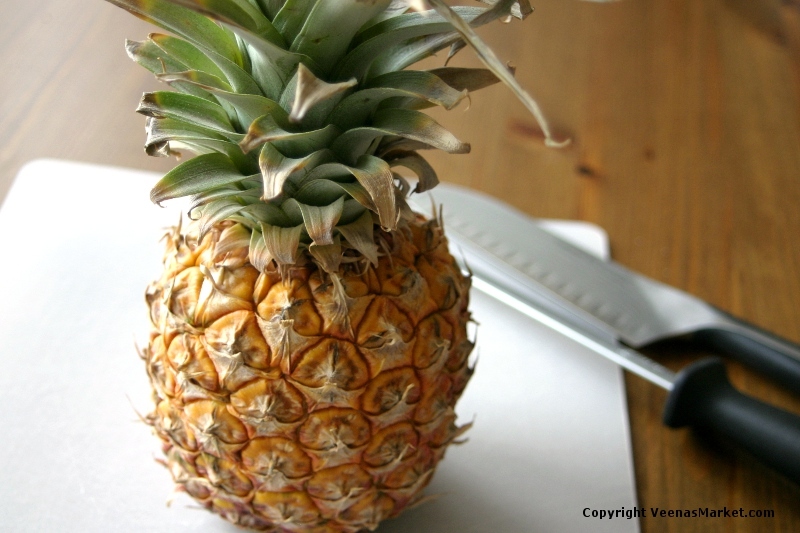 Canned pineapple may cook faster. 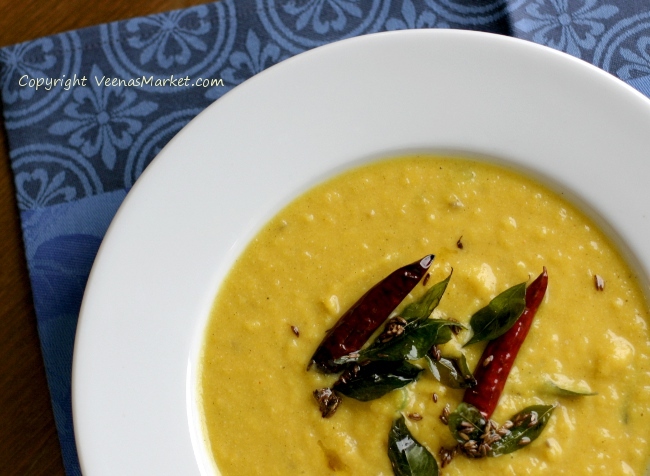 While waiting on the pineapple, grind the roasted spices and coconut with 1cup of water or as little as needed to make the flavor base or “masala”. I use my blender for this. Add the ground ‘masala’ to the cooked pineapple. Simmer uncovered for 10 minutes adding a bit more water if the curry starts sticking to the pan. Add salt to taste. 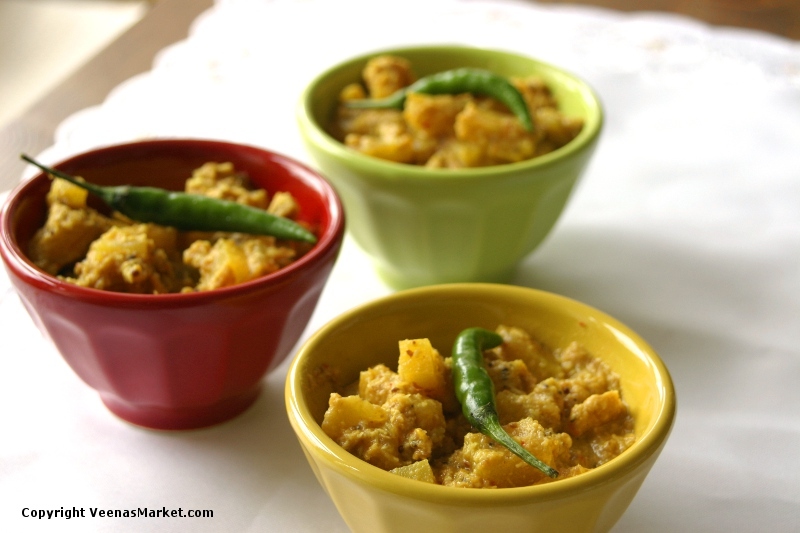 Serve over rice or with rotis chapatis, idlis or dosas. It’s been a while since I’ve posted a recipe. Not that I haven’t been cooking. Just that when I do, it’s in the evening and the light is terrible here in cloudy/rainy Seattle. Anyone else ready for some sun? I know I am and not just so I can take pictures in the evening. I know many of you are too busy to be able to cook much during the week. Or you are so tired that ordering in feels like an infinitely better plan than cooking and worse, cleaning up. I know the feeling. Since I don’t like eating out too much, I end up cooking simple dinners most of the time. This recipe is a great example. It is also a tasty way of using up greens that may not last till the weekend. 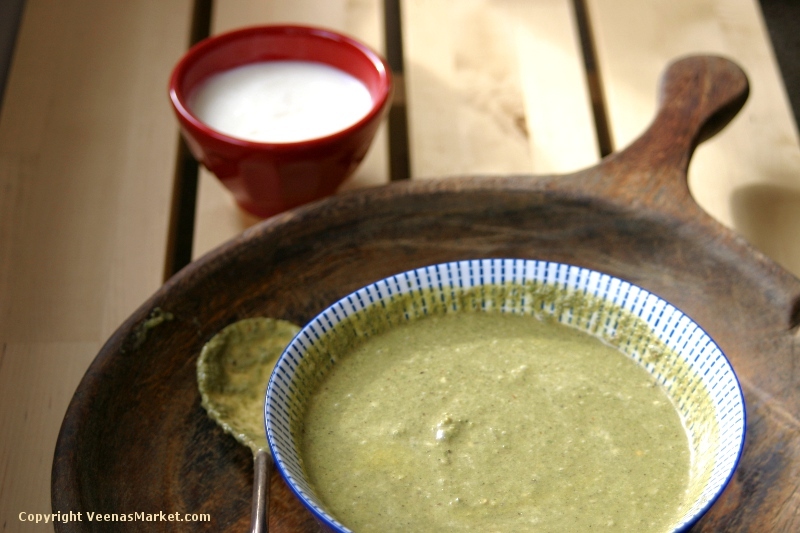 It’s kind of like the pesto of South Indian food. 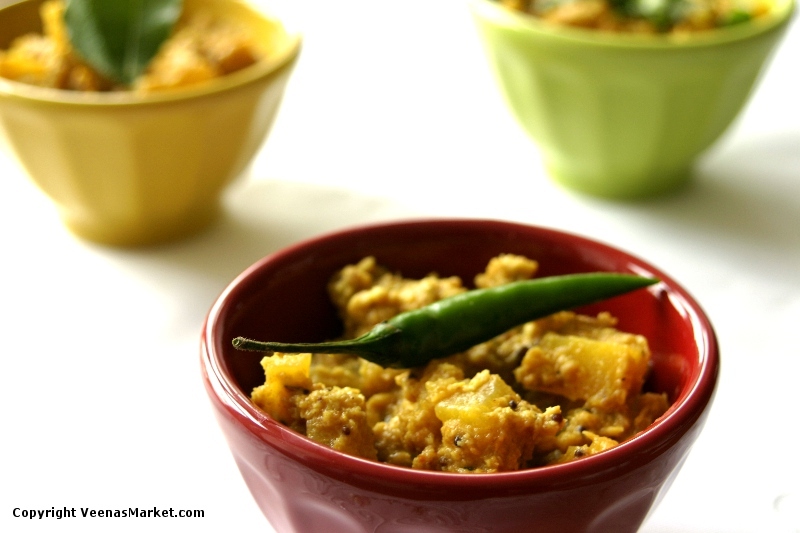 The dish is called Thambli and is typically made with garlic, South Indian red chilies (byadige), cumin, fenugreek and yogurt. Thambli is normally one of the first sides served in a thali meal in Mangalorean cuisine. But the recipe is versatile and can be used with greens like spinach and swiss chard. 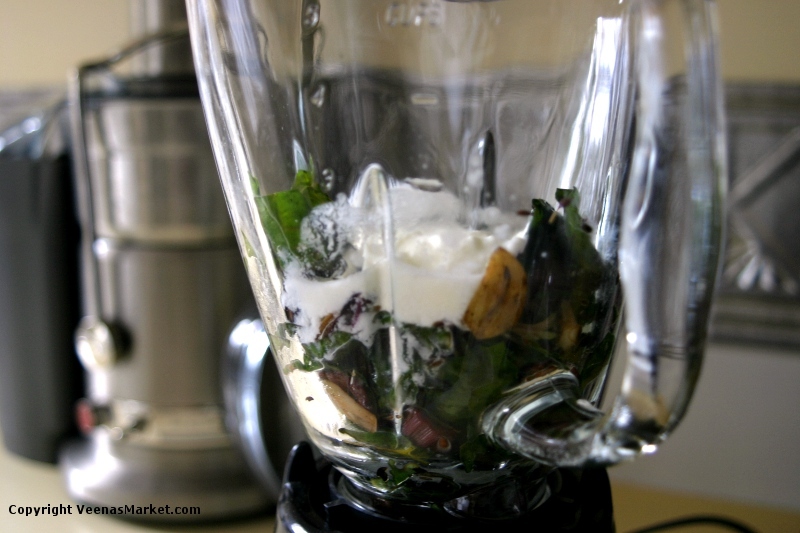 You could probably also use mustard greens or kale though you would have to sauté it longer or braise before blending. Thambli is always made with yogurt. I haven’t tried it without yogurt but I imagine you could blend with avocado or coconut milk to make it dairy free. Have you made it this way? I’d love to hear from you! 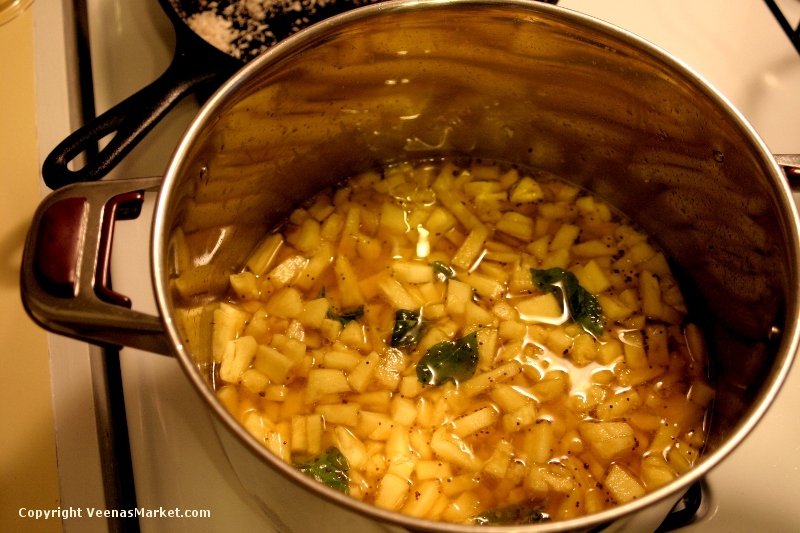 Heat the oil over medium heat in a pot or skillet large enough to accommodate the swiss chard. 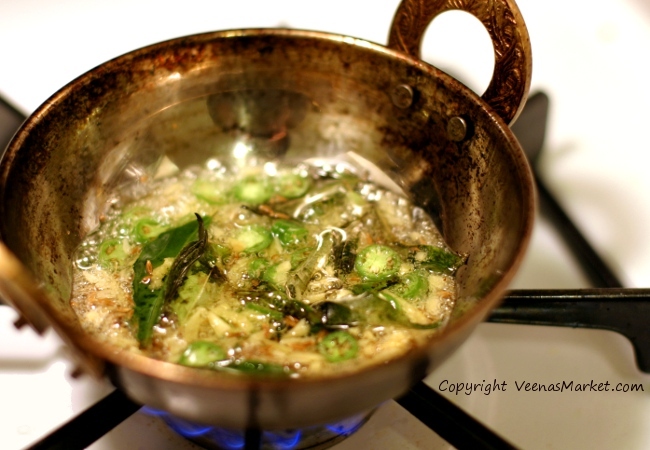 When the surface of the oil start shimmering, add the cumin, fenugreek, garlic and chilis. Let sizzle for 15 seconds while stirring occasionally to prevent the garlic from burning. Saute the swiss chard till it softens. You don’t need to completely wilt it. 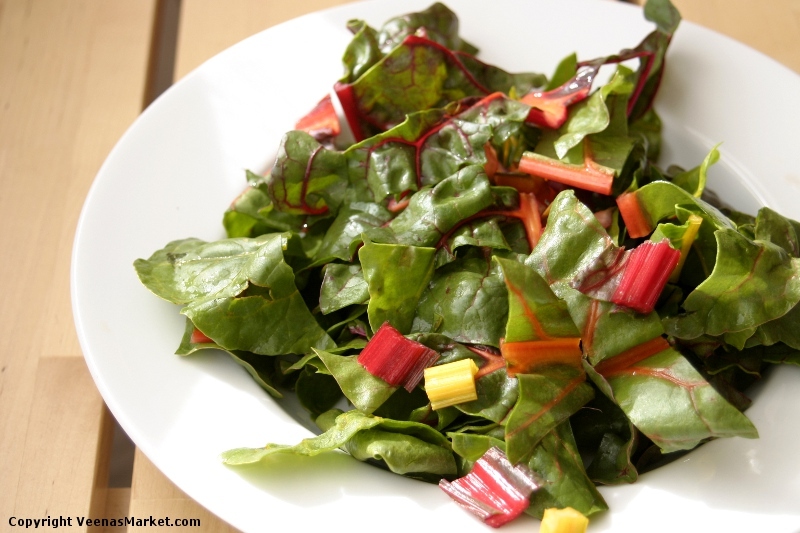 In a food processor or blender, blend the sautéed swiss chard with 1/2 cup yogurt and 1/2 teaspoon salt. Taste and add more yogurt or salt as necessary.